STREAKS, STATS AND NOTES — Texans have won past two meetings. Redskins last beat Texans in 2006. 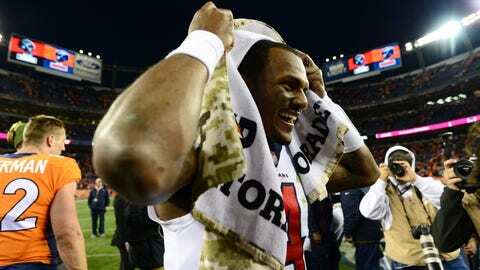 … AFC South-leading Houston has won six in row since 0-3 start. … QB Deshaun Watson‘s 36 touchdown passes are second most in NFL history in first 16 games after Kurt Warner’s 39. … Watson has back-to-back 200-yard passing games but has not thrown for 300-plus since Week 5. … Only five teams have allowed more sacks than Texans’ 30. … RB Lamar Miller has 100-plus yards rushing and TD in two of past three games. … WR DeAndre Hopkins coming off 10 catches for 105 yards and TD in Week 9. … Hopkins’ four games with 10-plus catches, 100-plus yards and TD are most in league since start of 2017. … Hopkins has five TD catches over past four games. … WR Demaryius Thomas had three catches for 61 yards in Texans debut vs. Broncos after trade from Denver. … DE J.J. Watt has nine sacks in past seven games. … DE Jadeveon Clowney has three sacks in past three games. … S Justin Reid had career-high nine tackles vs. Broncos. … Redskins lead NFC East by two games over Eagles and Cowboys. … QB Alex Smith had 100.5 rating and TD pass last week at Tampa Bay. … RB Adrian Peterson has 251 yards rushing and TD in three career meetings. … WR Josh Doctson has TD catches in back-to-back games. … Jordan Reed is one of four tight ends with 200-plus catches and 20-plus receiving TDs since 2015. … Redskins’ defense has forced turnover in 13 consecutive games, longest active streak in NFL. … DL Matt Ioannidis leads team with 7 1-2 sacks. … LB Ryan Kerrigan has sacks in consecutive home games. … S D.J. Swearinger facing Houston team that drafted him in second round in 2013 and cut him after two seasons. Swearinger tied for second in league with four interceptions. … Fantasy tip: Injury to Redskins CB Quinton Dunbar opens up possibility of big game for Thomas even as Josh Norman shadows Hopkins.